Tickets are $8. Purchase at the box office (cash or credit) Friday 9/19, 6pm - 10:00pm, Saturday 9/20, 12pm - 6pm. Lloyd Handwerker, Brooklyn, NY. Documentary Feature, 98:00, Brooklyn Premiere! 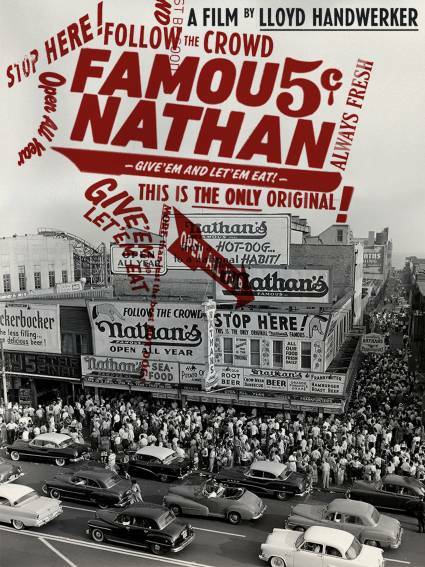 Famous Nathan is the first insider documentary of the legendary Brooklyn eatery and iconic NY institution, created in 1916 in Coney Island by the filmmaker's grandfather. Stylistically, the film is as kaleidoscopic and layered as Coney and captures the hustle-bustle, in your face spirit of the eatery in its heyday, featuring a rich assemblage of historical archive, family photographs and home movies and the discovery of rare audio recordings of Nathan describing his upbringing in a poor village in Poland, emigration to NYC and details of running Nathan’s for over 40 years. Intimate and often hilarious interviews with family, friends and workers--who share the ups and downs of their dedicated employment--reveal both family secrets and tall tales.